The midterm elections have provided a case study on partisan gerrymandering that shows how the drawing of district boundaries can affect who's elected to Congress. The sharply contrasting outcomes that resulted on Election Day in Pennsylvania and North Carolina illustrate the importance of how political lines are drawn — and the stakes for the nation because that process helps determine which party controls Congress. Manning held more than 400 campaign events, contacted tens of thousands of voters and had outspent the Republican incumbent in North Carolina’s 13th District — but still lost by 6 percentage points in a district Republicans drew to favor their candidates. Though an increasing number of states have adopted independent commissions, many states still rely on lawmakers and governors to draw legislative and congressional districts. Republicans controlled that process in far more states than Democrats because of their electoral success nationwide in 2010. Those maps were in place for the Nov. 6 elections, except in places where courts ordered them redrawn, and will be again in 2020. The results have national implications: Democrats potentially could have won even more seats in the U.S. House and state legislatures had it not been for Republican gerrymandering. North Carolina is a prime example of gerrymandering’s consequences. Republicans and Democrats in this month’s elections split the total votes cast for major party candidates in the state’s 13 congressional districts about evenly, with Republicans getting 51 percent (a figure that is slightly inflated because one GOP incumbent ran unopposed). Yet Republicans won 10 of those races, about three-quarters of the total seats. By comparison, Democrats in Pennsylvania received 54 percent of this year’s total two-party vote for congressional candidates, including one race where a Democratic incumbent ran unopposed. Democrats and Republicans each won 9 seats under a map drawn by the Democratic-tilted state Supreme Court with the assistance of an outside expert. Pennsylvania’s pro-Republican “efficiency gap” fell from 16 percent in the AP’s 2016 analysis to 7 percent under this year’s court-drawn map — a level that some political scientists attribute to the high concentrations of Democrats in urban areas that make it more difficult for them to win elsewhere. 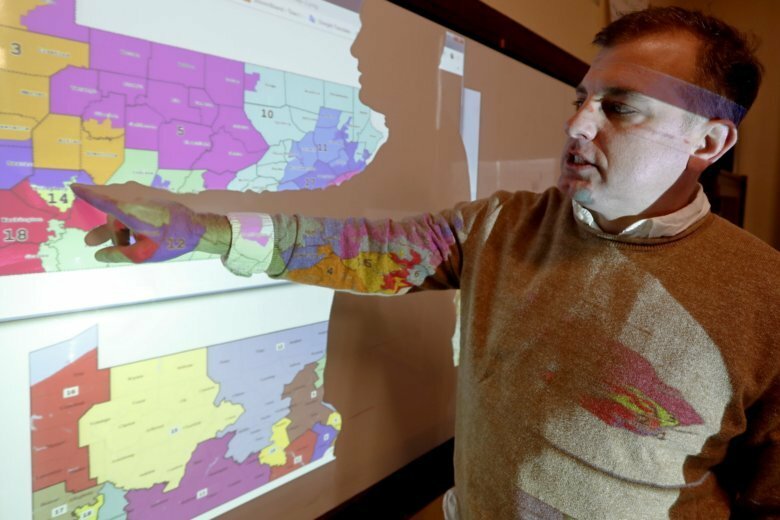 “The Pennsylvania Supreme Court robbed us of at least three to four congressional seats that we might not have lost if the redistricting would not have happened the way that it did,” Gottesman said. For state legislative districts, the AP’s analysis has found some of the largest partisan advantages in Michigan and Wisconsin. Democrats won 52 percent of the total major party vote for the Michigan House this year and flipped several Republican-held districts, yet Republicans still won 53 percent of the seats. Republicans controlled Michigan’s last redistricting by holding the governor’s office and both legislative chambers. They won’t control the next redistricting: A Democrat won the governor’s race, but voters made that irrelevant by approving a constitutional amendment shifting redistricting to an independent commission. In Wisconsin, a federal judicial panel invalidated the state Assembly districts as an unconstitutional partisan gerrymander in 2016. But the U.S. Supreme Court overturned that in June and sent the case back to the lower court to establish whether there was harm to particular voters. A new trial is set for April. Preliminary results from the 2018 elections show Wisconsin Democrats received 54 percent of the total votes cast for major party Assembly candidates — a figure inflated by the fact that Democrats ran unopposed in 30 districts compared to just eight for Republicans. Yet Republicans won 63 of the 99 Assembly seats, just one less than their pre-election majority. That marks an increase in the pro-Republican “efficiency gap” from about 10 percent in 2016 to almost 15 percent this year. Democrats also won or are leading in elections for all of Wisconsin’s statewide offices, showing voter support for their candidates in races that are not affected by gerrymandering. Republican Assembly Speaker Robin Vos called it a “faulty premise” to say that Republicans’ legislative majority is due to gerrymandering. “We are the ones who have been given a mandate to govern,” Vos said. But Assembly Minority Leader Gordon Hintz said “Wisconsin’s gerrymandered maps worked exactly as Republicans intended.” He said non-competitive districts have made it increasingly difficult for Democrats to recruit candidates and raise money. Wisconsin Progress, an organization that recruits and trains liberal candidates, said 30 of the 31 Democratic candidates it backed in Republican-held Assembly districts ended up losing in the Nov. 6 elections. Associated Press reporters Gary Robertson in Raleigh, North Carolina, and Scott Bauer and Todd Richmond in Madison, Wisconsin, contributed to this report.